The weather stations were all stating freezing rain. 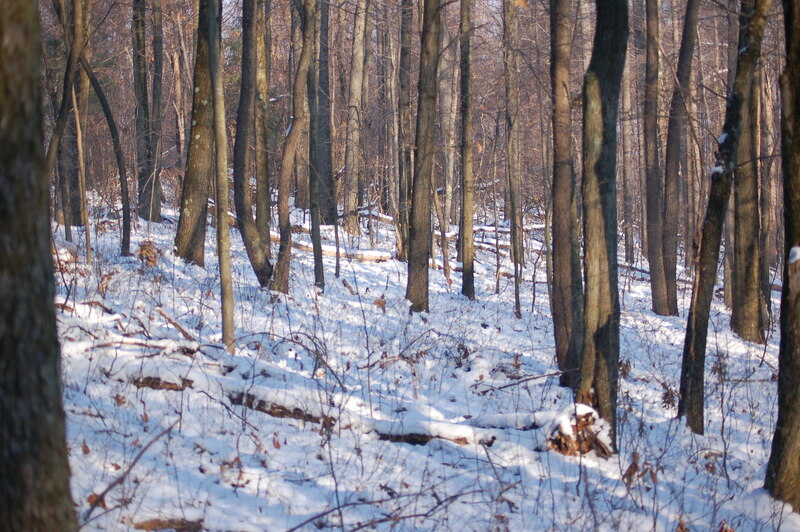 Bob and I eventually entered the woods around noon to pursue the white-tail. 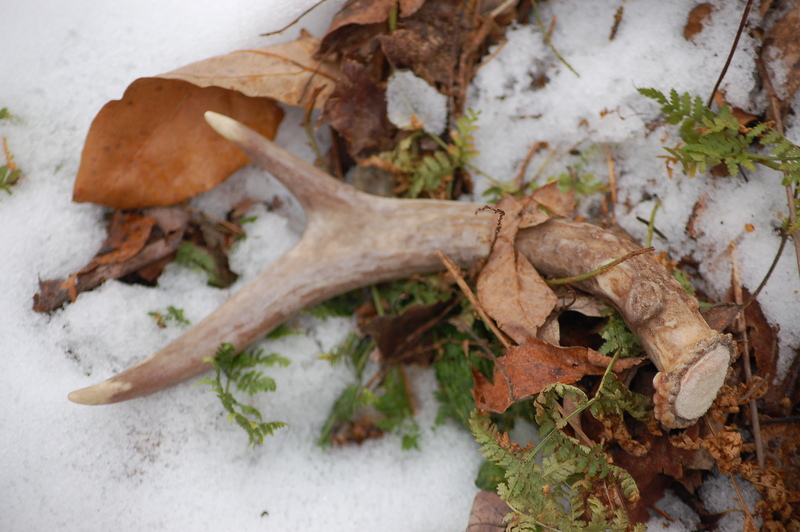 I was walking along preparing to walk through a pine grove when I glanced down and was surprised to see a “shed” antler. Hunters seem to admire these trophies and instinctively horde them. I chased deer around for a time, but failed to move any past Bob. We edged along a field discussing that deer should be moving and feeding when I touched Bob, whispering…deer! The body of a deer was feeding over a swell in the field. The deer was approximately 40 yards. Bob squatted and gazed through 2 feet high crabgrass. The shot missed! I heard a crack in the tree line. I trailed the deer over several hundred yards just to positive the miss call was accurate. It was! 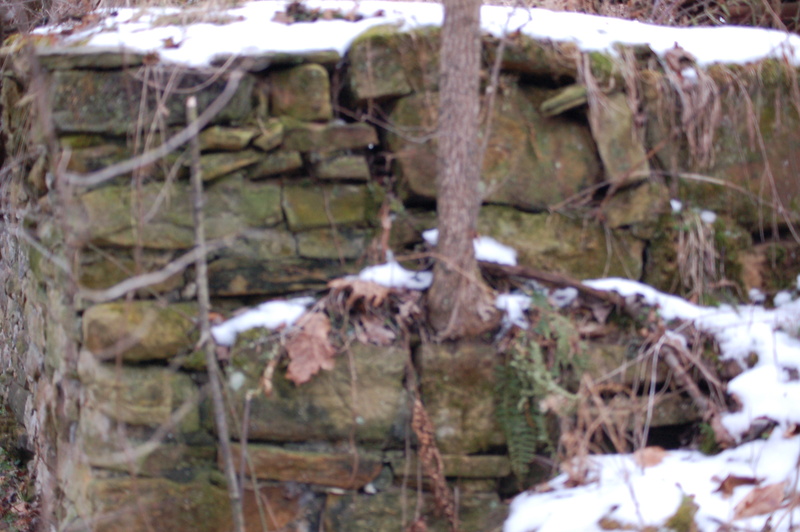 Later, I walked around an old foundation site. I must be getting old. I have faint memories of being in the old house in my youth. The house, even then, had long ago been abandoned . 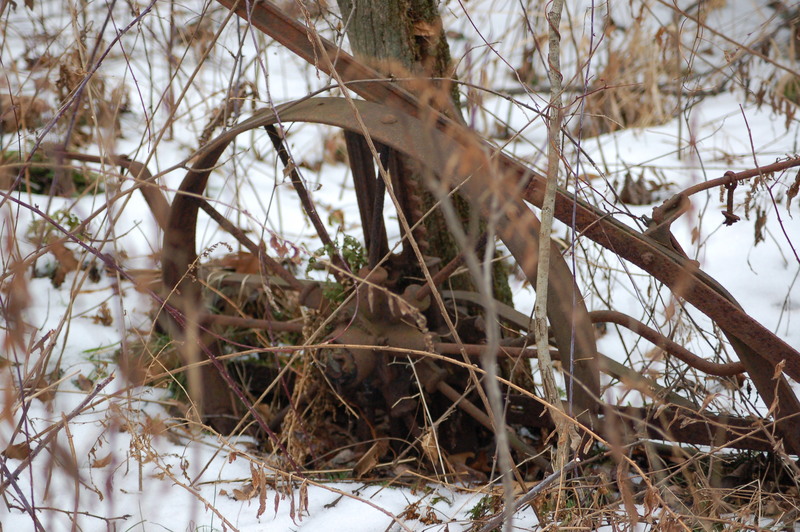 Today, all that is present is the stone foundation and some old rusted farm machinery. Bob became tired and we called the hunt off after two and a half hours. Bob does great for being 76 years old. 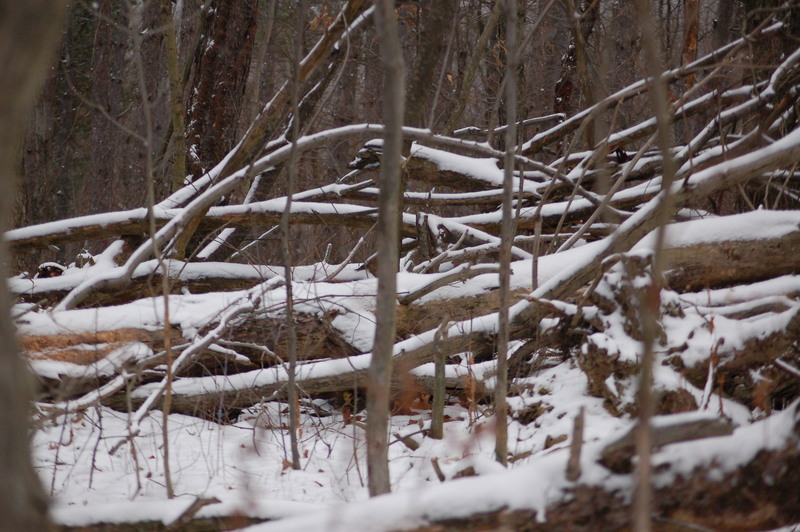 Snow on the ground and deer in the woods makes for some grand opportunities to observe and /or hunt deer. 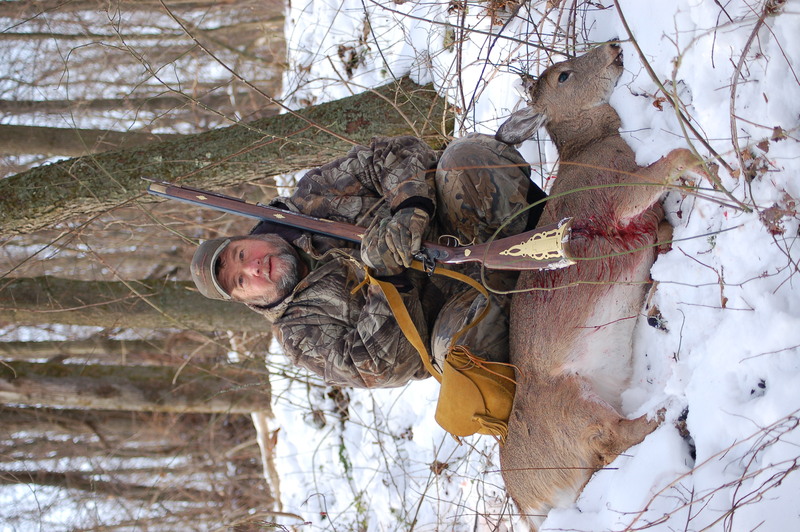 I do not have any deer tags left so my primary reasons to be in the woods this day was to take photos and move some deer around for my step-father Bob and my cousin Donnie Smail. Early in the morning we could hear some turkeys across the road yelping and cutting. 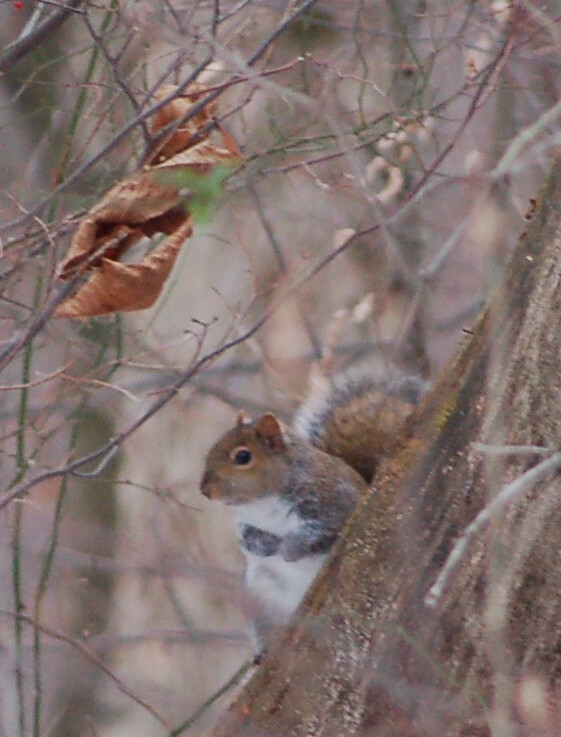 I pranced around the woods in various thick areas and saw several squirrels and grouse. I saw some deer also. I came down over one area and could hear turkeys calling out their alarm putts. I immediately assumed the birds had spotted me. 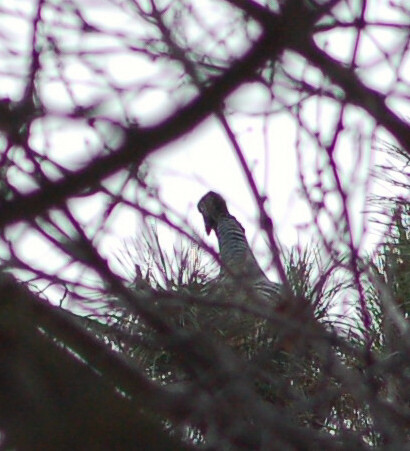 I continued to watch and eventually spotted a flock of about 15 turkeys. Suddenly the birds began to run and take to the air. They flew towards me! 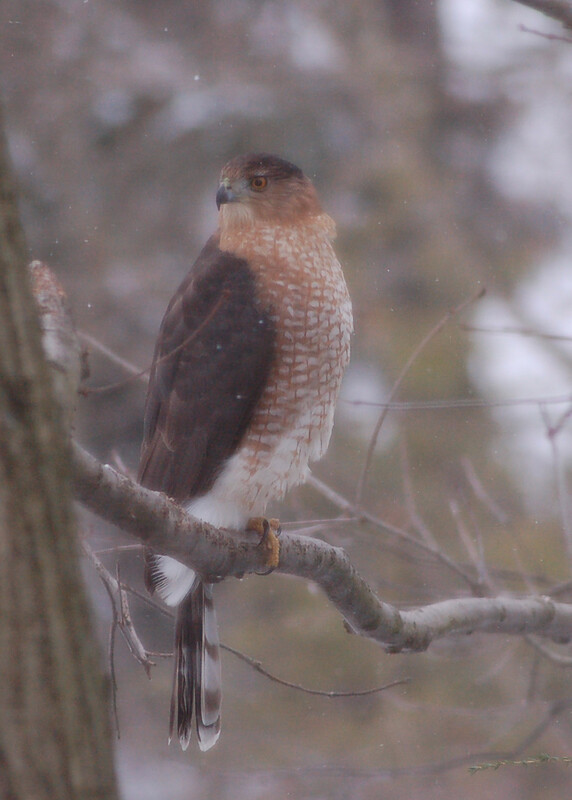 Some landed in nearby trees for a few seconds before continuing on around the hillside. Throughout the morning I would see remnants of this flock. The sixty yard shot hit true. The doe went about 60 more yards. Bob and I hunted until about 1:00 P.M. before going home for some deer burgers. 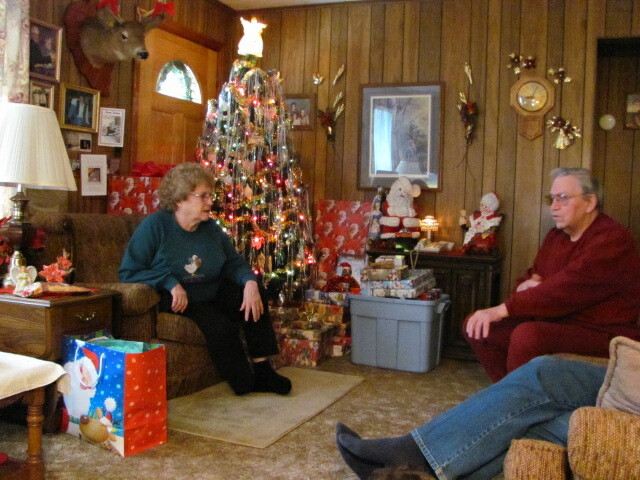 The 2010 Christmas consisted of much of the usual traditions and the making of new ones. Laurie, mom, Bob and I attended the Kittanning Free Methodist Church on Christmas Eve for their service. Laurie and I came home for some hot tea and our annual present exchange. We turn the radio on to a station featuring, mostly, spiritual Christmas music. 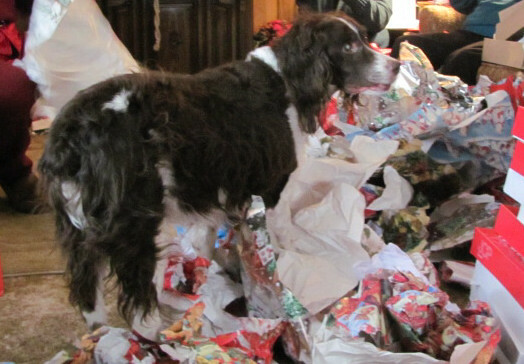 We enjoy allowing Susie, our Springer Spaniel to open her presents. She, somehow, knows her gifts over ours! 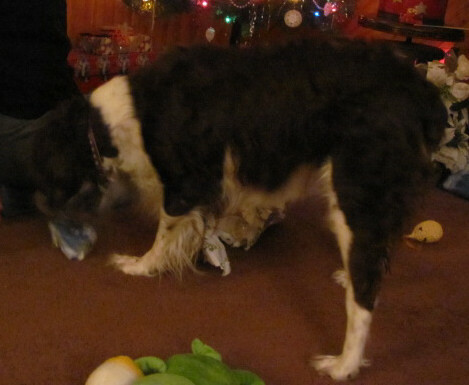 She opened one of her presents twice from under the tree before Laurie had to place them in a closet. December 25th, found us all at my mom’s home for Christmas and a great meal too. 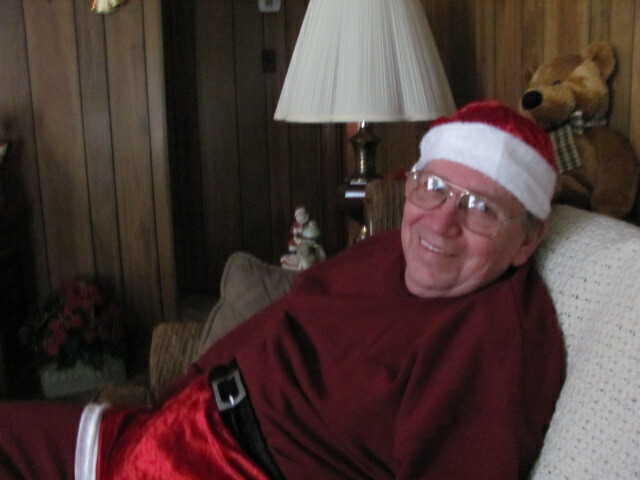 Bob, has started a custom of wearing his Christmas shorts and hat. I truly cherish my small family since we have no kids between us. Susie was expected to arrive too. She being almost blind brings us all much joy despite her issue. Christmas brings about some somber times to me. I remember my father and grandparents at this time. Boy, how I miss them all! I, also, ponder much on that event that eventually leads to what we now call Christmas. I become saddened at how the world, including America, continually push the Messiah away from all ends. Somehow, I can’t help wondering how long we can endure as we drift farther away. The family is small. My mother, Bob (my step-father) my sister Ruthie and brother-in-law Tim Wolfe and of course the Laurie and I spent the day together. 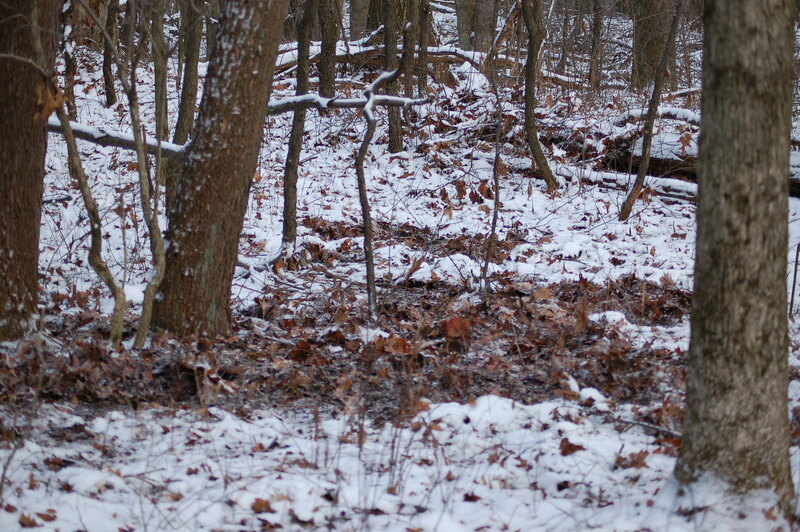 Later on in the morning we crept along a right-of-way peering for another doe we had seen going in that direction. Suddenly, I tapped Bob pointing over the embankment. I could see feeding deer, in fact, there were five deer feeding along. Bob, excitedly, prepared for a possible shot. Finally, one deer exposed it’s body from among the brush and Bob fired. From my position, slightly behind, I thought I noticed a flinch. I could only see the back of the deer. Of course, chaos erupted with deer movement all about! Two deer came up to our right and Bob fired again. I hurried along the right-of-way to see a single deer cross. I surmised the other deer was down. We surveyed the lower woods and saw nothing. I went over the embankment and shortly saw blood. I came back up over and looked down and within feet of us lay the doe along the ditch-line. 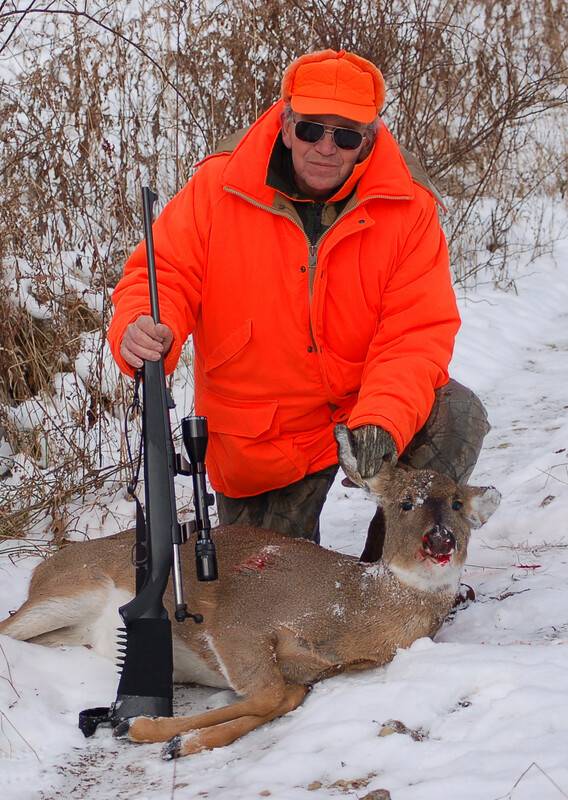 Bob tagged and field-dressed the deer. I took photos. He stated that he wasn’t entirely sure if this deer was the same one he initially shot at. A “red-flag” immediately blew in the wind. I said I better walk back and check around. I found sign of a hit and later saw the deer about 100 yards downslope watching me. I went back and told Bob what was transpiring. I knew I had to use my unused antlerless tag. I wasn’t hunting with a firearm. (I was waiting for flintlock season to use the tag.) I grabbed his 30:06 and placed one shell in the chamber and crept back to where I saw the deer. I placed the rifle against a tree and took careful aim and shot the wounded deer. One needs to always do what is right when hunting. The hunt was unfortunate, but in those minutes after the initial shot much confusion happened. Bob, was troubled with the experience and I worked to comfort him. It all worked out. I will be canning more deer and stocking up for the bad times ahead. I have been a busy little fellow. I spent Tuesday and Wednesday of last week butchering the buck. I made sixteen pounds of burger; canned 35 jars of venison; made jerky; cut steaks; and sliced some thin “steak-um like strips of meat. My butchering influence stems from my grandfather. In my youth, I enjoyed going to his butcher shop. Man…I miss him! Bob, as the Great Pumpkin! 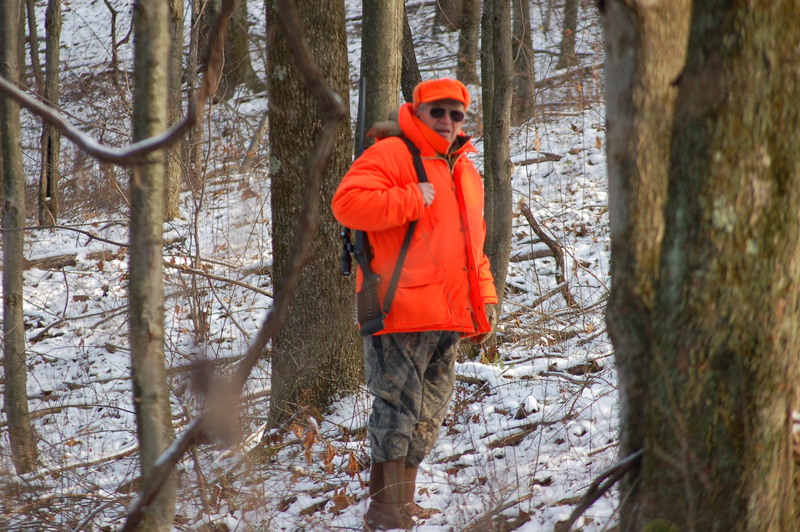 On Saturday, I took my step-father, Bob hunting deer. I told him where he should go and watch during the early hours. I went along in another direction seeking bedded or feeding deer. I hadn’t gone far when I heard the rustling leaves and watched a feeding deer below me. I made a sneak from the site and located Bob. We quietly approached the site and the deer was absent. I eased along a gas well road when I spotted three deer in a thicket. I motioned for Bob and he came to me. One deer walked away and directly below our position. In the minutes following, Bob missed! Storm site where I shot the buck. I continued hunting with my camera. I saw four turkeys; squirrels and a grouse. I, also, saw a number of deer during my trek around attempting to move a doe past Bob. I did see a nice buck, but I couldn’t get a good photot due to brush and trees. Imagine trees and limbs in a woods! We didn’t hunt the entire day. Bob failed to see many deer, but he seemed to enjoy our day afield. 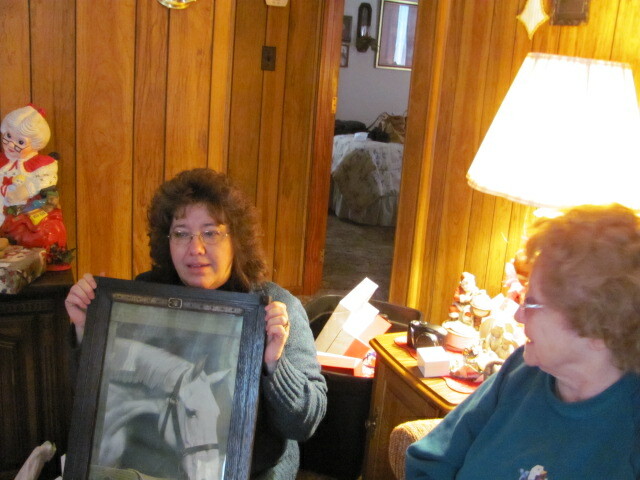 Sunday, December 5, the family all got together to celebrate my mother’s 81st birthday. Her birthday is actually December 6th, but we decided that Sunday, would work out better for all. We went out to eat and later filled up even more with birthday cake! My mother, Ruth (Smail) Miller is in remarkable shape. We all tease her a lot, sometimes, probably, too much. I spent the day finishing up my fourth painting depicting furbearers of Pennsylvania. The bobcat completed this series. The other three animals are: Muskrat; Raccoon; and a grey fox. Photos pending!